Be aware of the weather when completing your stucco repair. Extreme temperatures or weather conditions can impact the stucco itself, so watch out for freezing temperatures. Hot, windy conditions can also have a negative effect. Moderate, calm weather is best. Remove all of the stucco material that's not attached. Any pieces that are even slightly loosened from the lath below will harm the integrity of your repair. Remove loose material with a hammer and be careful not to damage the supporting materials. Make sure your hole has crooked edges. Your inner neat freak may clamor for a perfectly shaped circle or oval hole to start with, but fight those tendencies when repairing stucco. Straight lines actually encourage cracking, so make sure to start your repair with a ragged edge. Use at least two coats. Do not try to skimp on materials or save time by using only one coat. A thin coat will look terrible and one thick coat is more likely to crack. Depending on the size of your hole, use two or three thin coats, allowing them to dry thoroughly between applications. Give the drying process a day or two--no need to rush. Repairing a small hole or damaged spot in stucco should be a fairly simple process. For larger holes or more significant damage, make sure to check with an experienced contractor before deciding how to proceed. 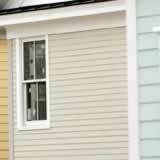 How does stucco affect your siding cost?